I picked up this Japanese porcelain ginger jar on eBay awhile back and have been intrigued by it ever since. For me, one of the most fascinating parts of collecting Asian art and antiques is the enormous amount of history learned though researching individual pieces and this ginger jar is no exception. 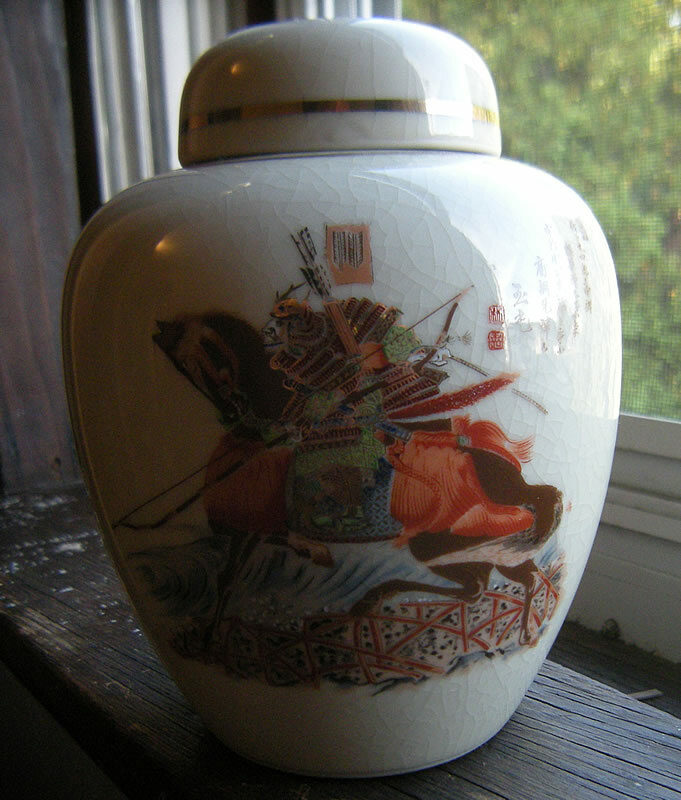 The jar depicts a Japanese Samurai mounted on a horse and has an inscription with two rakkan seals. I am told by my friend Seth Lim of Singapore that the inscription is in reference to The Heike monogatari tale of a competition between Japanese Samurai commander Sasaki Takatsuna (佐々木 高綱, 1160 – December 8, 1214) riding a white horse and Samurai warrior Kajiwara Kagesue (梶原 景季, 1162 - February 6, 1200) on a black horse, racing to be the first to engage in battle at the 1184 battle of Uji (宇治川の戦). Takatsuna was first (高綱先陣). I believe that the Samurai on the jar is Kajiwara Kagesue since the horse on the jar is dark, even though not entirely black, but more brownish. two rakkan seals that read 林 玉光 , Made by Hayashi Gyokko who was the artist that painted the scene on the vase. A decal is applied to the vase and is then glazed over with a clear glaze. 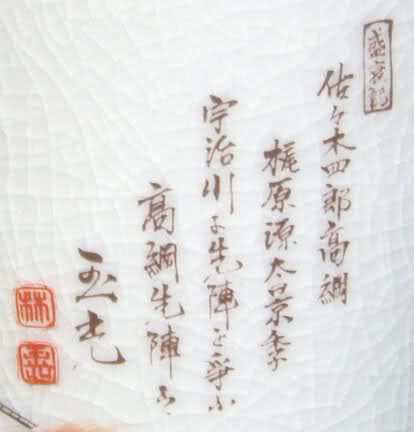 The bottom is maker marked with the Kaku seal of Yamahiro Mfg Co. Seto, Aichi, Japan. 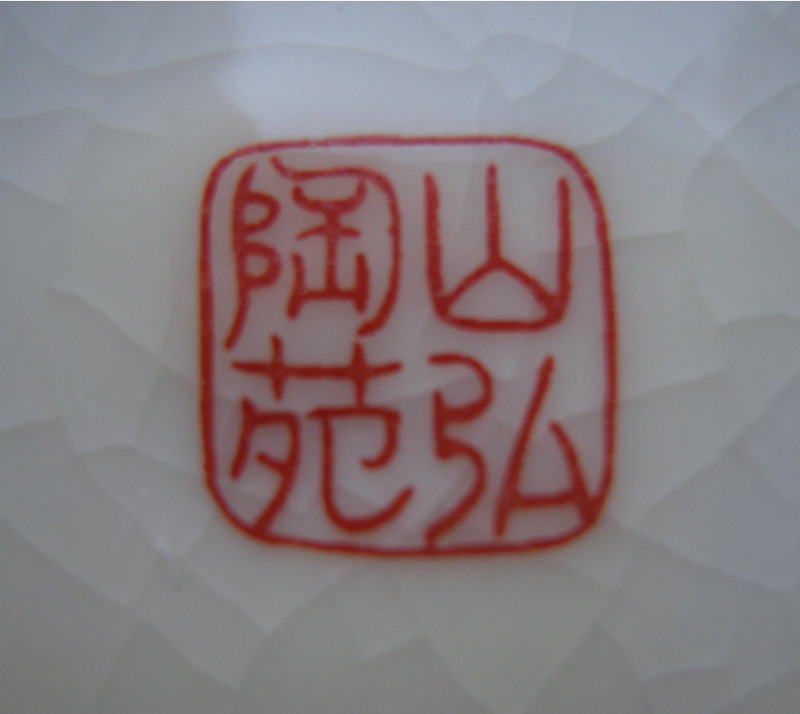 The seal reads 山弘陶苑, Yamahiro Toen, which translates as Yamahiro Pottery Studio. (or center). The pseudo-quasi "expert" Gotheborg erroneously claims the mark says "Sanko Toen" which is not even remotely close. It's flat out false. The only thing they got right on this mark is Toen, but I suppose that's the be expected considering the source. 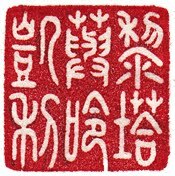 Seals translated by Hung-Yueh Hsu, Taipai, Taiwan. I have a vase that is longer and slimmer than this ginger jar. It has the exact same picture except the horse is black and it tells the tale. The bottom of the vase has a red signature. The name looks to be hand written of the bottom of the vase. How would I find out whose signature and the worth of the vase. I just received a set that my grandmother had that has the above mark. A couple peices have damage, but I was wondering if they have any market value?